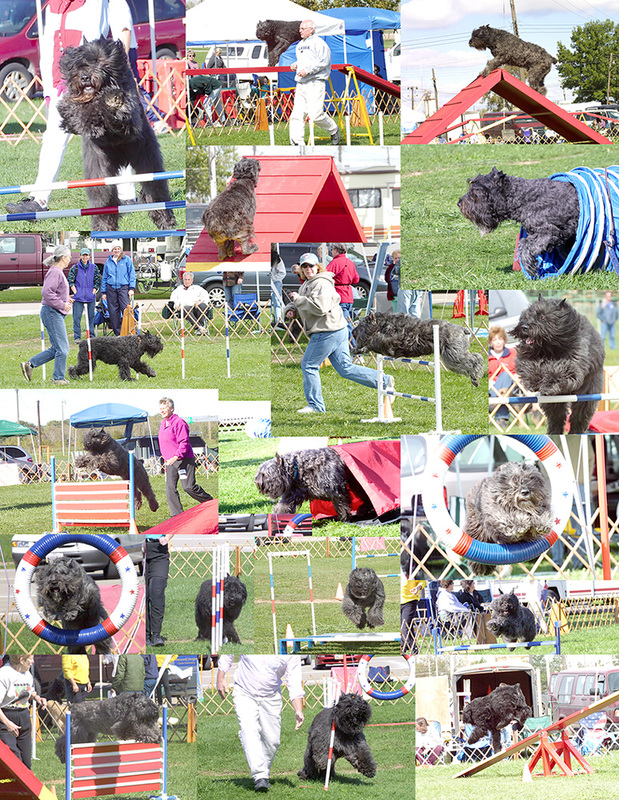 This composit image is of a number of shots I've taken of Bouviers running agility. Mike those are wonderful pictures! thank you for sharing them with us. I cant wait until I can work with Windy in agilaty. Pretty cool Mike. That would make a great poster. Where are some of those dog's ears? Sarah, yea, how can they fly around the track without big ears to act as spoilers and keep them on the ground. I have made a poster of this... actually several. I think one of these was used at another Bouvier Specialty to show some of the things Bouvs can do. I also used the one on herding and pictures of carting. I really need to get more pictures, but they just don't have very many shows out this way. Even the comformation crowd has thined out a lot. It seems all the action activities for Bouviers is always somewhere else in the country. I live in (greater) Portland, Oregon. How do I get my 4 year old and puppy Bouvs into agility? Do I have to have a lot of equipment and space? No Judy you do not need a lot of equipment or space to put a nice foundation for agility on your dogs. I have a moderate sized back yard and can train agility skills with a couple of jumps, a contact trainer, and a buja board. You can train all the flatwork, i.e directionals (left, right, etc), crosses (front, rear, etc), & distance without needing anything equipment-wise, except maybe a couple of traffic cones. Since it is a good idea not to have your Bouv pup jump before the growth plates close, you have at least 2 years to put the foundation flatwork training in. Susan Garrett put out a video called "101 things to do with one jump" or something to that effect. It is multiple, multiple exercises you can train with just one jump. Great video--worth the price if you're serious about training at home. You can get it from the Clean Run website. There are also several good books--Jumping From A To Z by Julie Daniels/Chris Zink is probably my favorite. There are probably one or two agility training centers/groups in the Portland area that you could look into. Research them before you sign up for any classes to make sure they train the way you like to train. Anyone who tells you (or lets you) jump your young Bouv at full height before age 18 months old (or right off the bat in beginning lessons) is someone you might want to avoid. That would tell you they don't know much about dog development, gait, or structure. And don't let titles impress you--many of the "world team" members are not folks that beginners--or nonbeginners--should take lessons from--they train too harshly (some of them, not all) and rush a dog along at too young of an age. I compete in AKC, UKC, & NADAC for agility. Each venue is fun--each asks different skills from dog & handler. The equipment is similar, but the style of the courses are very different. Judy, give me a call... there is an excellent agility instructor in the Wilsonville area that a good friend of mine has worked with in the past. She and her Bouv were titling at the elite level with very little trialing, but most of all they had a wonderful time together. See the pictures of Moose on our website. Columbia Agility Team (they have a website) also offers classes and trials all over the metro area. Love the composite - fun to look at the "age" of the pictures. 2 are of my girl Kinder "in her youth". One weaving and the last picture with only 1 foot touching the contact on the teeter. She's now 12. Must be time to get the younger generation into the pictures. Hi Kim, yea, how fast it seems like the years go by. It seems like just a few years ago that I took these pictures but it was a lot longer than that. I really enjoyed taking all of the agility pictures I took over the years, but they don't do a lot of agility here in the Northwest and we don't get out on the road as much as we use to. Thanks for popping on and taking a look and leaving a comment. All times are GMT -12. The time now is 12:32 AM.